Wow two posts in two days! A record for me this year. I'm glad everyone enjoyed the Easter Hop Jo coordinated. It was fun to take part in. I still need to collect a few more letters then try to decode the message. I thought I would give everyone a little update on my stitching, crocheting and Bean of course. I have about 7 weeks left before Bean arrives and she/he is growing so much! There's little room left in me and I spend my days hobbling, wobbling around like a penguin. My back pain is bad and the acid reflux just doesn't let up. So I'm counting down for those to go away but I also want to sleep before Bean comes! I know I won't get much of it and even though you can't stock up on sleep, I need to be rested before I start my work days. I've been trying to make more progress on my WIP's and adding a few more lines in my granny stripe because I know those will all be put down for awhile when Bean comes. 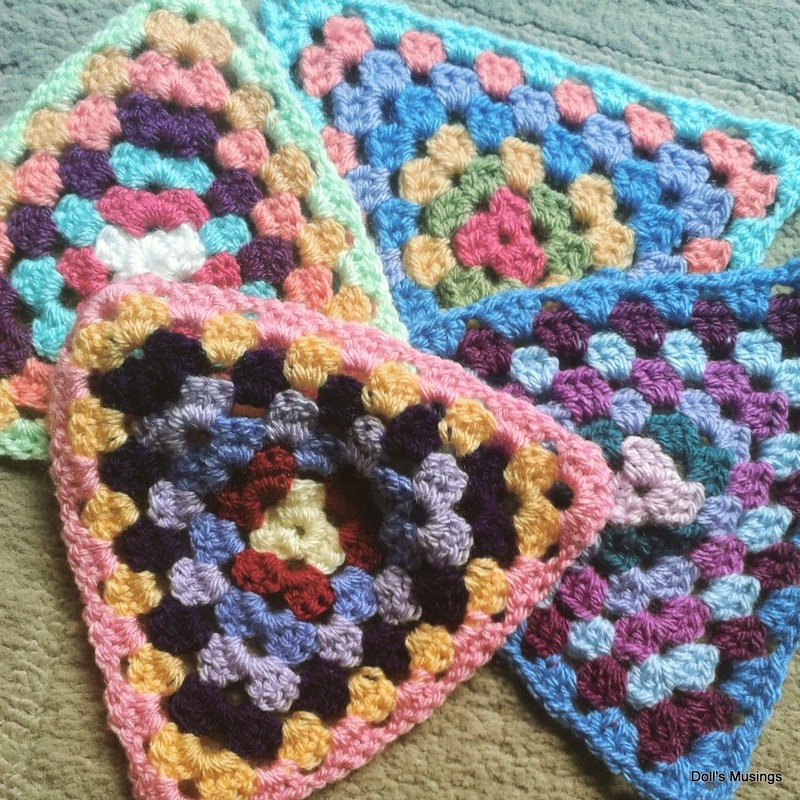 I made two more Granny square bunting triangles and I think I'll make two more before I string them together. Where I'll put them I don't know, but eventually they will go in Bean's room. 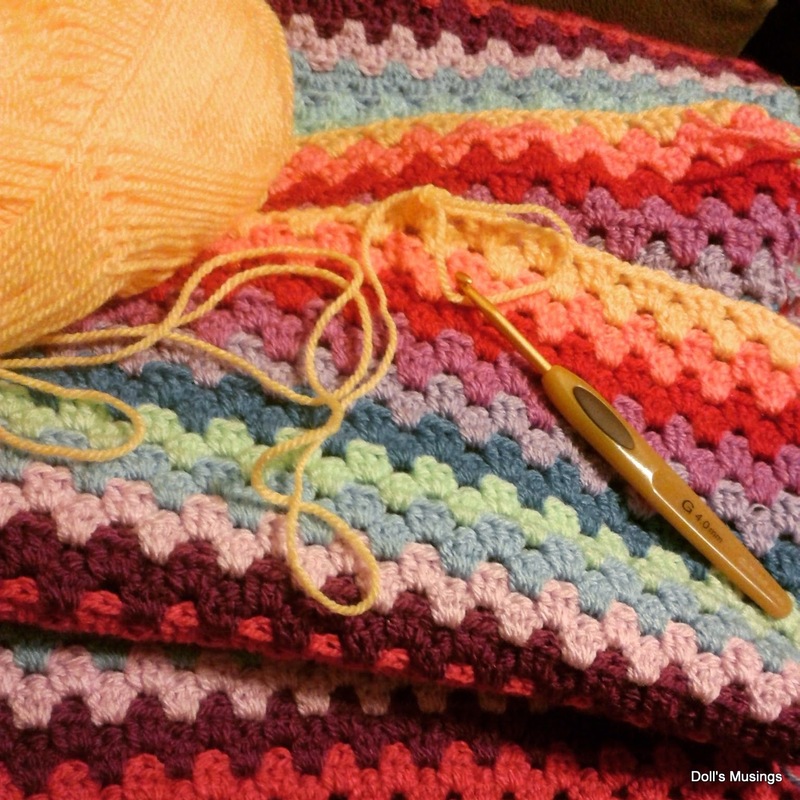 I have about 14 more colours to add to my granny stripe before I start the border. I hope to add a few more tonight. I've thoroughly enjoyed making this blanket. It's been almost a year since I started it and I hope to finish it soon. Now onto stitching. Sarah Chapple has been receiving some love. She is just the prettiest sampler. I love the colours and the honeysuckle flowers on the vine. I added the last few, little filigree details on JCS. There's still so much of this lovely sampler to do I don't know when this will be completed. I love how the backstitching really makes those flowers pop! I've been fairly faithful too to working on Knotgarden at least once a week. The last knot has actually more progress than this picture but I'm too lazy to pull it out and take a new photo. As for smalls, I wanted to start a new little stitch but haven't yet. There's just too many other things to work on for the moment! Oops, almost forgot to add. I stitched a wee bit last night on BOAF's Sarah Emery. She's such a sweet sampler and so pleasant to work on. I did buy some stash....why I don't know. 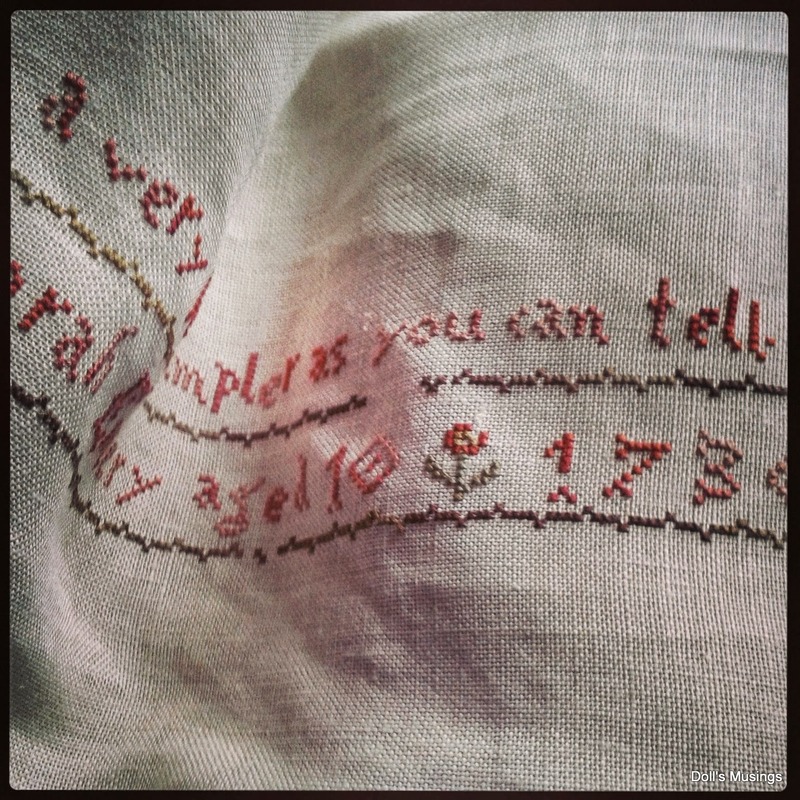 I bought a sampler from Scarlett Letter to make at some point in my life. Polly Phillip. She's such a beautiful sampler. I adore the blues! The amount of AVAS silks is crazy. I'll have to slowly collect them and maybe when Bean enters school, I'll have the supplies and the time to stitch her! Some yarns from Loveknitting asked to be bought. I love using Stylecraft's DK for the granny stripe so I figured why not add more colours to the collection. Fun colours to work with! I also got some baby wool to try out and I have some ideas of what I want to do with them. I also bought some charts from Maggee when she had her stash for sale. They are older BBD charts and I would love to stitch them some day! The other day, we had a visitor outside our window. Not sure if he's a hawk or falcon. He's such a majestic bird and I'm glad he stayed long enough for me to capture a couple of photos. Isn't he handsome?! I've seen him before but he flew off before I could get my camera. A very shy bird. Okay, I'm signing off now. We will be doing some pregnancy photos with my aunt next weekend so I hope to have some updated photos of us soon for you all. I truly appreciate all of your comments and I know I have been bad in replying and commenting. I actually caught up during Spring break but am falling behind again. Anywho, lots of hugs and love to you all!! Lots of lovely stitching going on. You might be surprised at how much you may still be able to do in the first few weeks Anne. When my son was born I managed quite a bit when he was sleeping - babies sleep a lot!! You have so many pretty things going on. I will be glad when Bean comes and mom can feel better. When I was expecting my son, I got every possible side effect in the baby books! so I do know how you feel. ooOoo! Your stitching is so very pretty Anne. What a fantastic bunting for baby. Why don't you have Lee raise the head of the bed just a tiny bit. I think this will help with the acid reflux. Whose pansies are those?!?! I love pansies. My favorite flower on earth. And those colors and the ruffles to them are awesome!!! Good thing you are doing all that beautiful crafting now. I suspect you won't have much time for it when Bean gets here. But I never had kids so maybe I'm wrong about that. Where there's a will, there's a way they say. Sorry to hear about your back pain and acid reflux....but it's all worth it in the end!Your crochet bunting is looking great and I love the colours of the wool stash. And as for your feathered friend, he's wonderful! The bunting is coming along nicely. Hope you get a few good winks in before the Bean gets here. Your stitching is very lovely. What an amazing picture of the bird. Gorgeous. Wonderful stitching and crocheting Anne. I LOVE your new yarn stash. Hope you are resting well, very excited waiting for the baby to arrive! 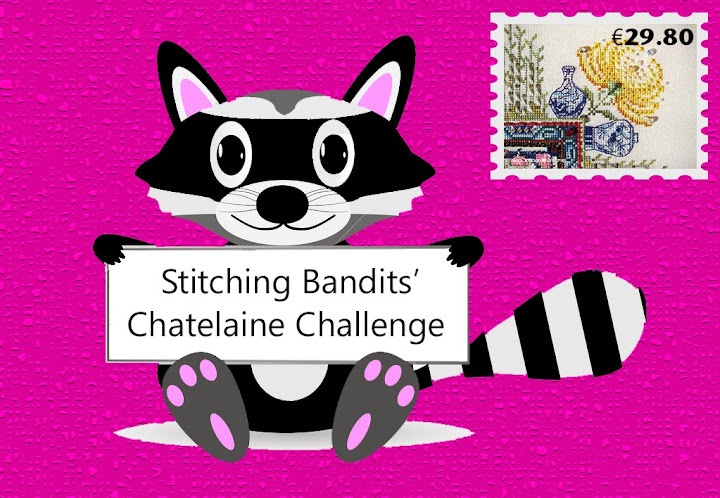 Gorgeous stitching, love all your samplers! Beautiful stitching and crocheting!! I love all your new stash. Good for you that you are being able to get some needlework done before your baby arrives & it won't be long now till he arrives. Sorry to hear about your acid reflex. No fun ( I had it to when I was pregnant). Gorgeous detailed stitching! I love Sarah Chapple, the colours are so pretty. Your new stash looks great too. I craft more now than I ever did (my boys are 5 and 6) as I don't go out in the evenings. Make the most of baby nap time - for stitching, sleeping, anything you like! Wow! Just 7 weeks! Hope your back and the acid reflux doesn't drive you crazy. Love all your stitching/crochet. So beautiful! Love Sarah Chapple! I'm tempted to start mine! Take care and Happy Easter! Seems like just yesterday you announced about Little Bean and now it is quickly approaching an arrival announcement! Your crocheting is pretty...and your stitching also. Hope your back will be less achy for you.Happy Easter. Happy Easter. You have some nice projects in the works. The baby will be here soon. How exciting. Lovely photos and great sitiching! I agree with Justine, once they are older you do have more time to stitch because basically you have no social life! Lovely work in progress. Love the of colours of Sarah Chapple. Oh I can just see you being busy trying to get as much done as possible before baby arrives! You've made so much progress, Anne! I'm sorry for the discomforts of pregnancy! We all had 'something'. I think I had sciatica. The penguin waddle! Oh I remembered that! Does the tunic I made you still fit? ps all your projects are looking lovely! Your cocheting is very colourfull You really talented 1 I really adore all your sampler stitchibg and wish that someday I would have that much cimttement to my stitchng.. I just love those Blackbird Designes Oldies !! Beautiful stitching and crochet! You must be so excited to meet Bean :D Take care of yourself, and enjoy your new goodies! Very pretty crochet and gorgeous stitching,especially Sarah Chapple. Wonderful crochet and stitching. With charts you never know when they are going to go out of print, if you love it, buy it! Great progress on all your lovely projects. I love the colours in your crocheting too! Beautiful! Hi, I'm new here, and wow am I overwhelmed by all that pretty in your post, I don't think I can get it all in one comment haha :D I really love that honey suckle sampler, and your Granny Stripes project is just awesome! WOW ... Sarah Chapple looks stunning. Lots of lovely progress you've been making on all your handmade goodies. Love the mail art in the post below, such a sweet design. You have done a LOT considering you are still working right? And before you know it, little Bean will be here and your days will fly by! Cherish it all! Take it as easy as you can... Hugs! Hard to believe the little one will be here soon. I'm sure you're ready. Love the granny triangles. I've never seen those before. OH yes, the last weeks are not so very pleasant - but soon it will be over and you will hold your little Bean in your arms. Such a lot of wonderful stitching that you show here. Your samplers are all so beautiful and it must be fun to pull them out and to decide which one to continue on. You are up to some lovely projects! Both samplers you are working on are gorgeous!! I have always wanted to try to make a granny square type blanket. I even have some squares that my grandmother made when she started one so one day I hope to make some too and crochet them all together. Can't wait to see more pics of the little one on the way! You must be getting so excited! Are you sitting with your feet up the whole day and craft??? Ow mY you did so much progress, Love all teh stitching and crocheting. Your granny stripe is so beautifull. Can't wait toos ee what you will be making of all the new colors!! Urgh, I remember those end of pregnancy issues well. I hope you can get to rest as much as possible. One thing you'll have to do, downsize on your number of projects in progress :p ehehheh All looking great sweetie!! !